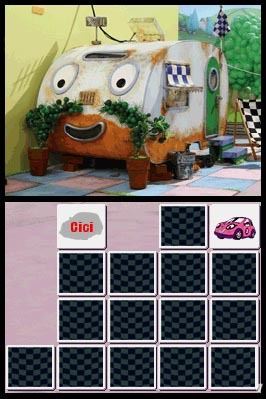 Based on the children's show of the same name, Roary the Racing Car skids onto the Nintendo DS which is strictly for the youngest gamer possible. If you're older than 10, you might want to look elsewhere for your enjoyment and more specifically, your edutainment. The animated series series revolves around "talking" cars that include Roary, the youngest of the lot, Maxi, a former Formula One car and Tin Top, a stock car that together with even more cars get involved in all sorts of mischief. The series also has some "human" characters in it such as Big Chris who is the best friend of Roary. It's basically the perfect archetype show for young kids. Maxi’s Missions – Light ‘Em Up Roary! 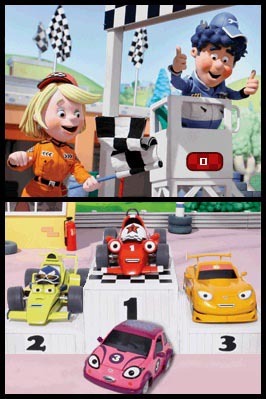 Spot the Difference Drifter’s Drives – Catch Flash! 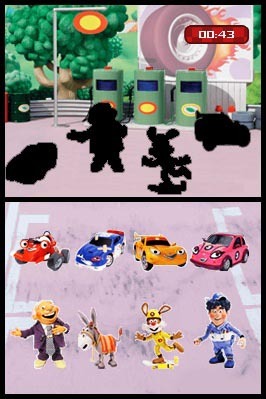 The games are then divided into the different colour coordinated cars in the series. For example, if you select Roary, you will have the option of competing in "Roary's Race", "Musical Mayhem" and "Big Christine's Tyre Challenge" with three choices of difficulty levels. The games are a mixture of fun (racing) and edutainment (memory games, puzzles etc). The racing games are very reminiscent of those early arcade games like Pit Stop that has Roary attempting to get the fastest time. Of course, Roary must avoid a variety of obstacles such as oil slicks and cones. The gameplay is quite basic and most kids should have no issue in playing the majority of titles. With that said, not all the games in the title are racing and can be quite diverse such as Tin Top's Sudoku which is a basic version of Sudoku aimed at children. The mixture between education and arcade actually works most times with this game and if you can accept that this game is targeted at the youngest of gamers, than it actually works quite well. The game even boasts a trophy system for children to aim towards and hopefully keep them quiet in those long car journeys. Some of the games in the title were a little tough for my 5-year old but with some help, he easily managed to master them but it does raise the question of why did they include some tough games when the majority of the game is quite easy? The control system of the game uses the touch screen to control the main gameplay such as the stylus used to control the car or to place your letters down for Sudoku or the various memory games or jigsaws. Easy stuff! Although the games are quite diverse, the control system is quite basic, ensuring that children will have no issues in mastering this title. Graphically, the title is reminiscent of the TV show and the in-game graphics are quite bright and simplistic. The game does contain some sound bites from the TV series and I must admit that the main theme song does get on your nerves, however my 5-year old had no issues with this whatsoever. If you're looking for a game without the hype and the violence, than this is the perfect title for the younger gamer. The gameplay is fun and will keep them busy, provided they don't find a Mario or a Nintendo game before attempting to play this title. Not the slickest title around but still fun.